We’ve reached that point in the year where I look in my closet and think “If I have to wear another sweater I’ll scream!” Along with getting tired of my winter wardrobe, the weather is moody and indecisive. While today it’s a sweater kind of today, tomorrow it could be warm and in the 70s. On top of these two #firstworldproblems, my husband and I are going through a financial course, so I’ve put myself on a clothing spending freeze. Shopping in my closet and putting together outfits I’m not sick and tired of has become a game to me. By putting in a little effort and making it fun, I have created some really cute outfits with very basic pieces. For example, I’ve always worn this cardigan with a short sleeve or sleeveless shirt. I decided to try layering it with one of my favorite white button down shirts and it works! I love how the sleeves with the gold buttons peek out. 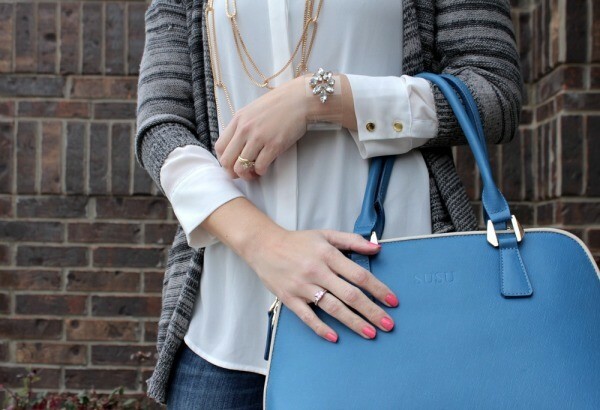 I then paired it with skinny jeans, black booties, great jewelry and my blue SUSU handbag, and I now have an outfit I’ll definitely be wearing again. I am loving my new ring from Ceri Jewelry. 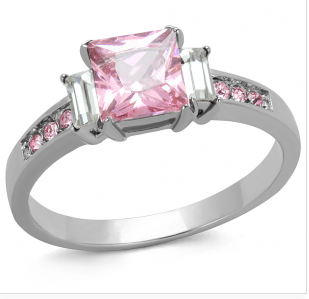 It’s their pink princess cut ring and I’ve worn it so many times. It’s just the right size and it looks fabulous with pink nails. Are you ready for Spring as much as I am? I can’t wait to wear some spring fashion like one of these floral tops! We’re in the 30s today and had a 2-hour school delay. 🙂 After living all over, it’s funny to see how different states react to different weather situations. And yes, shopping from my closet has been an eye opening experience. We’re trying to simplify things in 2015. Great cardigan I love that it’s not a solid or a print! 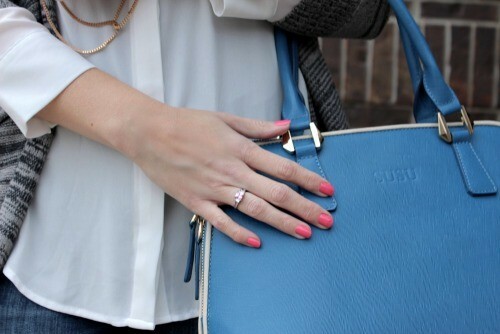 The pop of blue with the bag is perfect especially since we are all longing for spring! Oh spring! Where art thou? 🙂 Thanks Ellen! I think half of my outfits revolve around cardigans, I love how the can help stretch a summer wardrobe into a fall/winter/crazy Texas weather wardrobe.